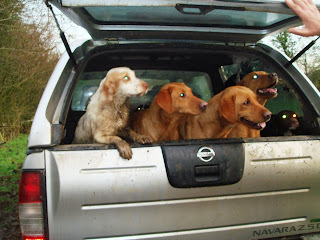 Belated thanks Shane Murphy for sorting out the website for Cuckavalda Gundogs. Shane is amazing and so patient after the numerous changes we keep making. There is still things we keep thinking of but think he deserves a Christmas break the same as anyone else. He uses some special little gizmo gadget and can move about on my computer where he is based while I watch it at this end . It saves me endless trips lugging the computer and all the dreaded wires across to his house so if something goes wrong or we mess up he can sort it in an instance. Do have a look at his web site http://www.siteart.co.uk/ as there is so much he can do for you if you need help. He is quite fresh from studying computers ,after qualifying last year so knows all the up to date stuff and ideas that make the difference between a good and bad website. Boxing Day was the traditional time of exchanging presents and Bess decided to present us with her puppies.Maybe a bit late in the day at 10pm She had 8 puppies in 4 hours -producing 5 girls and 3 boys. We took it in turns to sit up with her and Jack fixed another heat lamp up for them as it is still dreadfully cold here. This is the first time Bess has had pups and is quite the proud mother. It doesn't seem 2 years since she was a pup herself. Her lineage is that her sire is FTCH Tasco Monk of Mansengreen and dam Drakeshead Nougat out of FTCH Drakeshead Treacle and by FTCH Broadlaw Elder of Laggengill. The father of the pups is Billy Steels snr FTCH Leadburn Viceroy who was the top dog in Scotland last year and runner-up in the IGL2008. 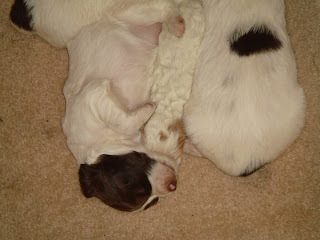 Here you see the pups with mum around 9 hours old. A sunny bright day here and not a cloud in the sky but still very very cold. We have a Labrador expecting pups in the next day or 2 and it would have been nice to have some arrive on Christmas Day, but Bess is still keeping us on out toes. 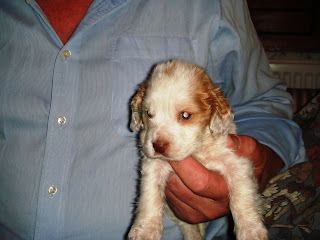 Although we have an alarm on her as it is her first litter I like to be about from start to finish. Anyway still managed to get down to the village for a few pints with Geoff and Tony. Having a late dinner after I have got the dogs done for the day.It is work as usual as it is a big day out on a shoot tomorrow. 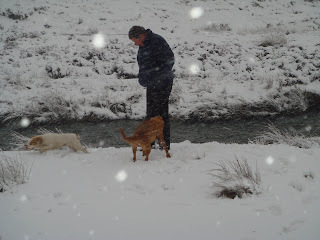 Little Owen and his mum and dad ,Fiona and Tony came up in the afternoon to see us and then they came to see the dogs having a run about in the snow. Nice to get over the fire again and get rested up as it will soon be 5am tomorrow. First thing the dogs are out come rain or shine and for once Quozzi is nearly out of the picture. You can partly see her on the left. Today it has still been very cold and with it being the winter solstice the shortest day of the year in daylight hours. Tonight it is Marks Christmas party at the Fauconberg Arms in Coxwold. If it is anything like last year it will be a good do. We have had a fair amount of snow. but it is work as usual . 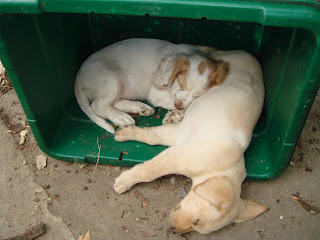 The Labradors are being they usual laid back selves and happy to pose for the camera. Again Quozzi like to be in the limelight and Jacks says she is even smiling for the camera. and many more glorious days to come. Having their first photo call of the season. As you can see Quozzi is the Kate Moss of the dog world. Always the star of the show and leading lady. Fast forward to Quozzi going shooting . As you can see she cant wait to get out. We got a yellow labrador pup called Bess and finally it was decided that Quozzi should be introduced to another dog and understand she wasnt a human. They got on really well and now she is just part of the team. 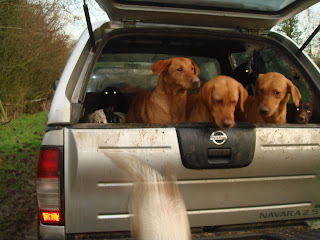 She is still a character and tends to stand out from the other dogs in her antics. Whatever she does she is never in the wrong . 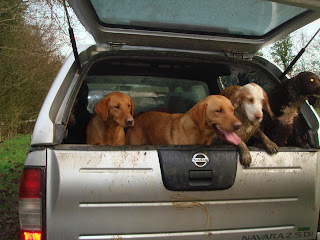 This blog is going to show you what goes on during the year with Cuckavalda Gundogs. Although Jack ,the boss, is not into computers with Quozzi's help you will get to see things which we hope are of interest to you. Quozzi was hand reared and for any one who knows her she is quite a character,does her own thing and has a mind of her own. She amazed even the vets with her will to live and continues to rule the roost .She started off been rejected by her mother when she arrived 12 hours later than her siblings and spent the next month on top of the Aga. She suffered pneumonia twice, concussion when she fell out of her box off the top of the Aga when she pushed the lid off and a dislocated shoulder.She had the embarrassment of constipation and had to have castor oil and then got to the cats food and was ill with that. 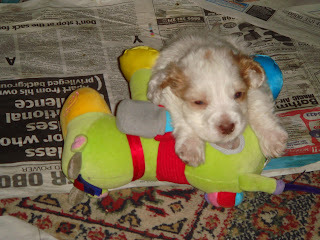 Here you will see how she went been a scrap of a puppy who was fed every 2 hours -day and night with a pipette then went on to a syringe and now she is part of the gang. Whether you would call her a dog ...for someone who for the first 8 weeks of her life her only contacted was humans she called easily be called a hudog. 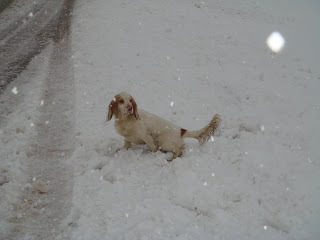 As she is now a proper working dog she may be quite embarrassed by the photos you see on this page. 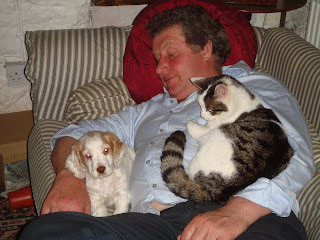 The first photo you see here at a week old laid in the middle of some 3 week old springer spaniels keeping warm .This gives you some idea of how small she was.